VERSATILE and economical anti-fatigue and safety mats have been released by The General Mat Company to help employers cost-efficiently meet occupational health and safety obligations. The 24/Seven 570-WH and 24/Seven 572-SOL mats provide comfortable and secure footing 24 hours a day for people working in wet and greasy areas (WH types) and in predominantly dry areas (SOL types). The durable 15mm thick rubber mats are modular designs that plug together via a hidden interlocking system to fit neatly into spaces of different shapes. Featuring a knobbed underside to keep the mat firmly in place and with an optional 75mm wide bevelled safety edge for easy cart access, they can be specified in 900 x 900mm single workstation size or in multiples to cover large areas. The Model 24/7 570-WH, with holes for drainage, is made from grease-resistant rubber comprised of 50 per cent nitrile while the Model 24/7 572-WH features a solid surface with pebbled texture for traction. 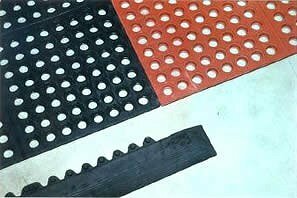 Customised mats are available in 300mm increments on standard sizing. GMC managing director Michael Siegle says the two 24/7 designs are designed to encompass, in an affordable format, the worker protection features most commonly sought by employers in commercial building, factory, food service, institutional, industrial and workshop situations.